Although Robert Bloch (1917-1994) will forever be known as “the author of Psycho” (1959), I’m willing to make a case that his first novel, The Scarf (Dial Press, 1947), is his true masterpiece. So why is it forgotten? If it is as wonderful as I claim, why is Bloch not known today as “the author of The Scarf”? Perhaps someday he will be. 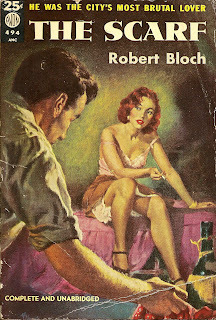 It has been interesting to watch over the years as previously neglected noir writers such as Jim Thompson, David Goodis, Charles Willeford, and Fredric Brown turned up in snazzy new Black Lizard/Vintage Crime trade paperbacks and achieved new renown and respect … whereas none of the noir masterpieces of Robert Bloch have achieved a similar rediscovery. True, two obscure Bloch short novels were published earlier this year by Hard Case Crime as a back-to-back double--Shooting Star and Spiderweb--but these are both relatively minor works. Bloch composed a handful of major crime novels and numerous significant tales of mystery and imagination. For anyone familiar with his work, it should be easy to envision an astute publisher repackaging the best of Bloch’s oeuvre for a new, more appreciative generation. Might I suggest the following collection of titles? : The Kidnaper, Psycho, The Dead Beat, Firebug, Blood Runs Cold (a criminally perfect collection of classic short stories), American Gothic … but first and foremost, The Scarf. Hmm. Now wait a minute. Sounds like a great opening for a novel, doesn’t it? Actually, this comes deep within Chapter Two, in a segment labeled “Genesis” that helps explain where the main character comes from and what he is about. Never mind. I would venture that now, having read those lines, you might already be willing to buy an old battered copy of this book, without having learned anything else about it. I’m not into spoilers, so rest assured, if not in peace (or in pieces, as Bloch would say), that I shan’t give anything away. But what exactly is The Scarf about? The old Avon paperback (circa 1950) that I’m looking at says, “HE WAS THE CITY’S MOST BRUTAL LOVER” and has a moody painting of a man holding a scarf, heading toward a loose redhead. “Most brutal lover” is a nice euphemism for “killer,” I guess. The Scarf is about a man, Daniel Morley, who has, as he describes it, a “fetish,” which refers to his scarf, which he’s had ever since Miss Frazer was his English teacher in high school. Hmm. Now, whenever a woman gets too close, and the threat of commitment looms, something comes over him, and he finds himself draping the scarf around her neck and pulling tightly on both ends until she is strangled to death. This is all revealed, in classic Bloch fashion, by the end of Chapter Two, so I don’t consider that a spoiler. ... Anyway, as the killer moves from Minneapolis to Chicago to New York to Hollywood, strangling in his wake, we are kept in suspense as we wonder whether he can save himself from himself. The Scarf, despite being a bleak portrait of a twisted murderer, makes us care about the main character because of Bloch’s acute psychological insight and empathy toward his personae, all told with a sense of irony, foreboding, a clean prose style ... and all the makings of a Freudian nightmare. It is a masterful example of first-person narration. Daniel Morley keeps a diary of sorts that he calls “The Black Notebook,” which records his experiences, his dreams, his confusion, and his fears. He doesn’t really understand why he kills, and the black notebook is his self-imposed therapy, of sorts, that helps him decipher the clues of his past to uncover his own raison d’être ... or raison de tuer. We are never outside of his mind for a moment, and the culmination of the story is a tour de force. It is hard to conceive of any publisher today, large or small, taking a chance on The Scarf. It probably wouldn’t even make it past a literary agent. They would insist on making the character “sympathetic” (to their way of thinking) or providing a rhyme or a reason for his killings that might make The Scarf more palatable to the Gentle Readers out there. No, The Scarf wouldn’t stand a chance today without being gutted. It’s just not a “nice” book. But this is where the publishers and agents often get it wrong, because what readers want is not “sympathetic” characters but rather ones whose motivations can be understood, whether the character is a good or a bad person. In The Scarf, Bloch created a novel of suspense that is finely tuned as only a master craftsman can make it, its mechanism driven by the mind of a damaged soul trying to understand himself. Few writers ever used Freudian theory to such good effect as Bloch does in The Scarf. And what did I say earlier about Psycho? Although an excellent novel, it hinges entirely on a gimmick (that of Norman Bates and his dual personality) that suggests Henry James pulling a neat trick on the reader--entertaining, suspenseful, but ultimately a shaggy dog story posing as a conte cruel. ... And the psychiatrist’s explanation at the end, like that in Alfred Hitchcock’s movie, is a rather clumsy way to conclude the tale, but necessary in order to make the story comprehensible. By contrast, The Scarf makes perfect sense of itself via the black notebook--no psychiatrist needed! Why is Bloch generally not as appreciated by mystery fans as he should be? Perhaps it has to do with his books usually being categorized in “horror” or the fact that he never wrote a series character (his one private-eye novel, Shooting Star, was a one-off). But most of his best novels might be better categorized as psychological suspense. The Scarf, from 1947, prefigures Patricia Highsmith, Ruth Rendell, and other authors who have plumbed the depths of the homicidal mind. The French, with their impeccable taste, have always venerated Bloch to a higher degree than his native countrymen (which is why I’ve peppered this piece with snippets of French, in homage). As for me, I’ve always made sure that I’m never too far from a copy of The Scarf. Fetish? You name it. READ MORE: “The Scarf, by Robert Bloch (Avon, 1947),” by Cullen Gallagher (Pulp Serenade). To date, my only Bloch is the HCC double. And, as I mentioned in my review, they were good...just not great. Now, after this splendid review, I'm going to search out The Scarf. Thanks. I enjoyed Spiderweb as much as I enjoyed anything this year. The plot moved so swiftly and elegantly that it was like Chinese food - I wanted another one right after I finished it. I'm going to have to track this one down also. Haven't read the HCC double yet, and I think I'll hold off on those for now. There are two editions of the book - Bloch wrote a different ending for the latter in the early sixties (that came out as a GM paperback). It seems you refer to the earlier edition. I've read only the latter, and I don't know which one reads better.